The annual CIHT consultants file has droped onto our door mats again. We are pleased to report that our continued hard work, investment in development and innovation has once more moved us up the league tables. Overall our turnover in the Transport and Highways sector has gon up by 20% over the past 12 monthsdemonstrating both a renewed confidence in the industry, but also confidence from our clients in the services we provide. 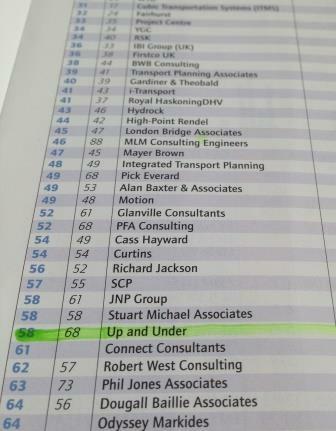 We have seen The Up and Under Group move up 10 places in the league table of companies ranked by transportation turnover. 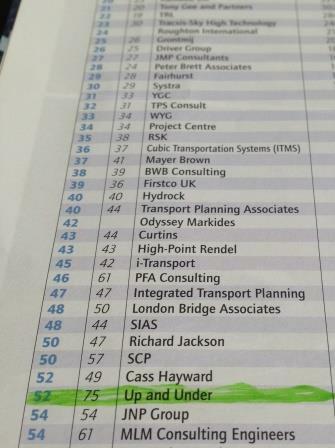 Most strikingly of all is the move from 75th to 52nd in the list of companies ranked by transport staff. This improvement in performance is due to the dedication of the team at Up and Under Group and the belief shown in them by our clients, thank you all. If you would like to discuss how we can assist you with your transport related asset management including inspection, testing, surveys of access related maintenance take a look at www.upandundergroup.com or call 01270 589615. We are LINKUP registered and ISO 9001/OSHAS 18001 accredited. This entry was posted in Blog and tagged CIHT.